Right around February 15, when the Easter candy typically appears in stores–that’s about two weeks before the Christmas ornaments appear, right?–the four of us tend to get a little giddy. We love Cadbury eggs (creme for me and J, caramel for Jim and D, usually), Reeses peanut butter eggs, and Cadbury mini eggs, and we usually have at least one of those varieties in the house at any given time, through Easter. Yesterday after work I wandered into the kitchen, a walk that was taken as a result of a Sweet Tooth Attack. I found what I was looking for, the ziploc bag of Cadbury mini eggs. I’m not even going to finish this post, because there are no words for THAT. I hide snacks from my menfolk all the time. If I don't I would starve… or at least never eat chocolate again. They owe you a new unopened bag, all for you. I find it beyond hysterical that you give Easter candy for Hanukkah! It however isn't hysterical that they mooched all your candy, those brats! No dinner or Facebook for them for at least a week!!! So wait, let me understand this full and clearly – as Jews, you look forward to Lent (Candy in the stores season) and hate the thought of Resurrection coming, because the candy disappears, only to have your jubilation reoccur during Advent (the Christmas season), when Hanukkah usually occurs. Okay, that's my self entertainment and personal laugh for the day. I know you take it in good humor. Wiping the coffee from off of my screen, dang that WeaselMomma!!! At least there's plenty of time to buy another bag. took me forever to get this…i was looking for something wrong with them. not getting that it was the QUANTITY that was wrong. that makes me CRAZY in my house. but at least its the right time of year to replace them. i get it. 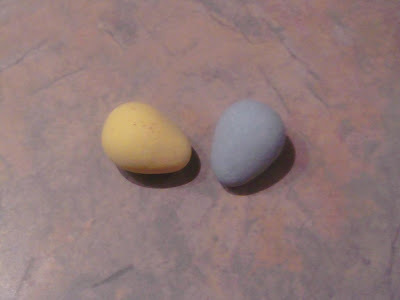 i need to buy easter candy–yellow chick peeps and pink bunny peeps (the other colors are the work of the devil;)) early enough so that i can slit open the package so they'll be stale enough for the resurrection–and my liking. i get it. mmmmmmmm. C A D B U R Y. They make some of the yummiest candy in the world. What I don't understand is why Cadbury doesn't make something like Chocolate Covered Passover Peanuts, or Noshing Nibbles (which would look remarkably like Mini Eggs) or even some Holy Hanukkah Sticks (which would look, feel and taste JUST LIKE Goetz's Cow Tales). They're ignoring a whole audience – whether they know it or not. 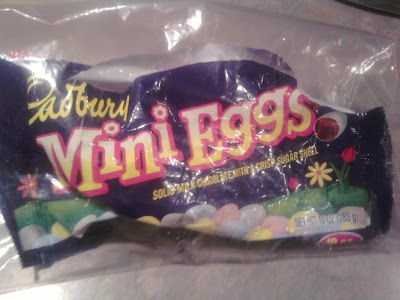 One of my co-workers (also Jewish) LIVES for these mini eggs & Cadbury eggs. I don't get it! I've never had either one of them. Love chocolate but I'm not a fan of Easter candy. I HATE those "yellow #7" filled PEEPS! So sad they might as well left nothing then just two. I haven't been able to get those hard shelled chocolate eggs we got in WI and IL down here in Knoxville. You know the ones. They are soooo good. I think Hershey makes them. Who is buying the next round of candy? I think one of the boys should.